At a younger age you are able to see different distances sharply due to changing the shape of the eye lens. Over the years the eye's ability to make the lens shape rounder decreases and therefore people with good far and near sight at a younger age develop a need for plus-glasses or reading glasses in middle age. This condition is called presbyopia. As a result of 5 years of development in the fall of 2009 Carl Zeiss Meditec completed the Laser Blended Vision presbyopia correction software, which makes it possible to free both near-sighted and far-sighted people, as well as those who didn't need glasses until now, of reading glasses. This innovative and patented ablation method changes the shape of the cornea so that the depth perception of the eye is significantly increased, i.e. without changing the lens shape the eye sees for a greater distance range than usually. Bringing sight from a far distance to reading distance or 33 cm, the eye has to increase the optic strength by +3 diopters to see well. 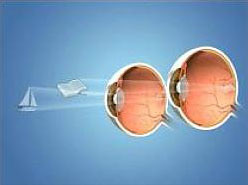 The initial aim of the method's development was to increase the depth perception of the cornea up to 3 diopters so that the eye could see far as well as near without changing the lens shape. Unfortunately it became clear during the investigation that with changing the shape of the cornea it is possible to increase depth perception safely only up to 1.5 diopters without influencing vision quality, contrast sensitivity or twilight vision. However, such depth perception doesn't allow people to see both far and near well with one eye without glasses in case of lens rigidity typical to people over 50 years old. Therefore a tested principle of monovision was additionally applied. Like with hands, one eye is more dominant than the other. In case of monovision a situation is created when the person sees far sharply with the dominant eye and near or intermediate distance with the other eye. The main difference with ordinary monovision is that with eyes with increased depth perception the difference between optic images of the eyes seeing both far and near well is significantly smaller. Therefore so-called micro-monovision is significantly more tolerable than ordinary monovision and the difference between the optics of the eyes may be greater. In case of ordinary monovision the depth perception of one eye is up to 0.75 diopters depending on the corneal characteristics; therefore, when covering a 3-diopter range an intermediate uncovered field occurs and the images of both eyes don't merge easily into one in the brain. Rather the suppression of the image from the eye focused far or near takes place when looking near or far, correspondingly. In case of ordinary monovision it is hard to merge the images in the brain. By increasing depth perception to 1.5 diopters one eye is able to see very far and intermediate distances, and the other eye near and intermediate distances. As the vision acuity of both eyes to intermediate distances is the same in case of micro-monovision, the merging of the images from two eyes is easier in the brain. In case of micro-monovision it much easier to merge the images in the brain. With non-ablated and optically non-changed cornea the increase of myopia is accompanied with the loss of one line in vision acuity table per 0.25 diopters. Due to increase of depth perception, an eye with -1.5 diopter refraction, ablated with "Laser Blended Vision" module software, sees far like with -0.75 diopter myopia and near as with -2.25 diopter myopia. As the vision acuity of an eye with good near vision is also quite good when looking far (30-80% of what is possible), micro-monovision is tolerated by 95% of people, while ordinary monovision only by 60%. Along with femtolaser safety there is a safe solution of 40+ femtoLASIK procedure for those wanting to get rid of reading glasses that doesn't reduce vision quality, contrast sensitivity or twilight vision. See Laser Blended Vision video from YouTube. Here you can read a story about how doctor Pait Teesalu got rid of his glasses.